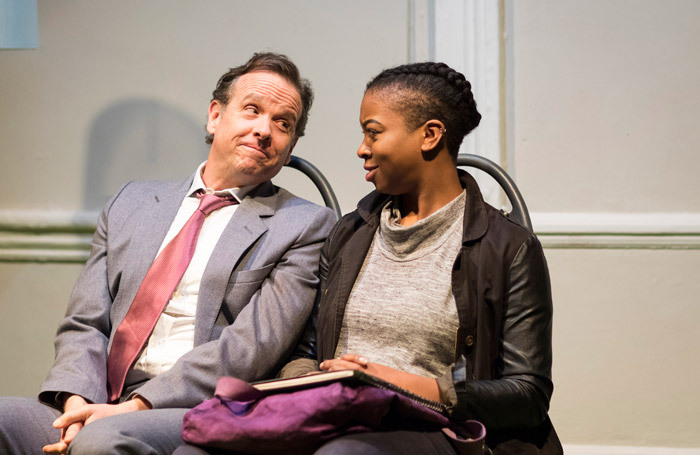 Spoiler alert: something happens just before the interval in Bruce Graham’s White Guy on the Bus that twists it from a compelling but wincingly wordy dinner-party debate into something altogether darker, sharper, and more exciting. Graham’s play splices together two narratives. In a rich, white suburb of Philadelphia, filthy rich trader Ray and his teacher wife Roz squabble about race politics with their surrogate son Christopher and his fiancee Molly. In a dangerous neighbourhood in North Philly, Ray rides the prison bus, the only white man in a coach-load of black women. These scenes flow into each other, and it’s only at the interval you realise what’s going on, how they relate, and why there is a white guy on the bus. Philadelphia-based Graham deftly crystallises the characters’ surface-deep prejudices and privileges, asking big questions about power and race. It’s politically charged and exhilarating. Jelena Budimir’s production for Precious Panda Theatre is stylish but not flashy, the two strands melding into one another on Sarah Jane Booth’s part bus, part living room set. There are two superb performances as well, from American screen actor Donald Sage Mackay on his London debut as Ray – decent and restrained until he goes all Walter White – and from Joanna McGibbon as Shatique, the young woman he befriends on the bus. The Finborough programmes rediscoveries of forgotten 20th century writers along with UK premieres of successful American plays. This policy has borne fruit yet again.